Helen Keller once said that, “Life is either a daring adventure or it is nothing.” It is the sentiment contained within this quotation that has inspired me throughout my life and specifically motivated me to commit to this unique challenge. My goal is to raise £6,962.00 for the Help for Heroes Charity, by reaching the summit of Aconcagua, Argentina during 8th – 31st January 2010. At 6,962m, Aconcagua is the highest mountain in the world outside of the Himalaya and with a target donation rate of £1 per metre, a very worthwhile goal for a charity that truly does make a difference to the lives’ of ordinary people doing extraordinary things. 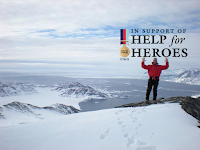 So why Help for Heroes a friend recently asked; as an enthusiastic mountaineer myself, I was inspired by the recent achievements of Major Phil Packer who was not expected to walk again after suffering a spinal injury whilst serving in Iraq in 2008. Yet you may recall that this year he completed the London Marathon, rowed across the English Channel and successfully climbed the 3,000ft sheer rock face of El Capitan, a mountain in Yosemite National Park - clearly not a guy who hides ‘under the circumstances!’ This is a big target and I need the help of a lot of people to achieve this goal, so I ask you to dig deep and donate now. I am paying ALL of my own trip costs and using the services of Adventure Peaks, a specialist mountaineering company based in the Lake District who are organising the expedition. Therefore 100% of your donation (128% if you tick the Gift Aid box) will go to the Help for Heroes Charity. Donating through JustGiving is simple, fast and totally secure visit www.justgiving.com/climbaconcagua2010. Your details are safe with JustGiving – they’ll never sell them on or send unwanted emails.